This seven-day programme is the perfect introduction to health and wellbeing. Muay Thai Battle Conquer Gym is set in the heart of Thailand, among lush, green farmland, surrounded with a panoramic view of the majestic Phetchabun hills. 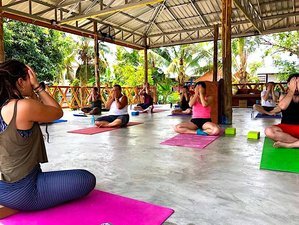 We cover Yoga, Meditation, CrossFit, Hiking and Muay Thai in a traditional Thai family setting with some real hidden gems. If you're looking for an all-around experience, then this is the camp for you. Now imagine being at a retreat that combines all of these and puts them together such a way that your new lifestyle change becomes second nature. -Welcome to Battle Conquer. We offer a variety of different yoga and meditation experiences through out the week so that you’re not short of choice. Our guided meditations are rather special and conducted during the temple tours, expect to learn a variety of meditation styles. Sunday is the gym excursion day, please see included excursions for more details. Please note that the schedule is subject to change and availability. The Meditation experience is very special, in the week you will have the opportunity to take part in guided meditation classes delivered by our experienced yoga and meditation instructors, learning key meditation skills in some beautiful locations such as the Dragon Temple and jungle waterfall. The week ends with a unique and spiritual trip to our local temple where you are treated to teachings and guided meditation from our only English-speaking monk. Meeting the English speaking Monk is a very spiritual experience. You will be able to ask him many questions as well as sit and meditate with him. Afterward, you will take a hike with him along the rocking maze or stone steps at Coral Mountain. The drive to the monastery takes you through the beautiful Phetchabun Hills, the scenery around the monastery is extremely pretty and the views at the top of the hike are breathtaking. Be sure to have your shoulders and knees covered to be allowed to enter the temple, shoes must be taken off before you go in. Also, as part of Thai tradition, it is good manners to take the Monk a small gift for example food, water or money is perfect. Everyone looks forward to the Sunday rest day! There are many beautiful places to visit in Phetchabun, so on Sunday, they take you to their favourites. It could be the stunning Nong Pye Lake, one of Phetchabun's largest set deep in the valley with beautiful panoramic views, take a raft out and relax, swim, fish, if you’d like refreshments, it’s not a problem, simply wave a flag and you can order the most delicious food and drinks delivered to your raft. Sapailo Temple is another lovely location for a trip out with its pretty gardens and caves to explore or we may take you to the hot spring baths. Every Thursday and Friday, we have a meditation practice at the temple or lake. On Friday evenings, you can tour the vibrant night markets. Battle Conquer can also arrange fishing in our local ponds. There is a lot to see and do, so please ask if you want to see something specific that's not listed here and they will see what they can do to help. There are so many amazing experiences to be had here from visiting temples and meditating with the monk to taking out a raft on the largest lake to fish and swim. Noi's Cafe serves up wholesome Thai food in a canteen style offering two different dishes accompanied with rice and salads or vegetables. Thai food is one of the tastiest and healthiest foods around the world and here in the farmland it’s even more nutritious. All the fresh food is carefully selected and bought from the local markets every morning. If you’ve ever wondered what real, home-cooked Thai food tastes like you will find out at Noi’s Cafe. Noi's Cafe home-cooked Thai meals are full of a variety of different vegetables, fruit and herbs and spices, providing a range of nutrients and health benefits. Noi's Cafe does not use any dairy and only have the freshest cuts of white meat or fish (optional). This makes the food incredibly healthy and detoxifying, a clean eating diet like this one is perfect for weight loss. Breakfast at Noi's is the most important meal of the day, it's protein and fibre rich to keep you full, that said if you are at the camp and feeling peckish at lunchtime fresh fruit and salads are available on request. While we try to cater for everyone please be aware that you will be traveling to Thailand’s farmland, far away from the usual tourist destination, we are the first camp of our kind. Our family cook all the food and the standard diet is white meat, fish, eggs, tofu, nuts, rice, fresh vegetables and fruits. It’s all locally sourced and brought fresh from the markets, the fruit and vegetables served will depend on what is in season. To support the detoxing process, this package includes 3 Thai massage treatments at our salon in town approximately 15 minutes drive away. Transport is complimentary.